Elgin Ridge Wine Estate sits high on the slopes of a mountain in the Elgin Valley, South Africa. Endless panoramic views stretches over our vineyards to reveal the entire Valley surrounded by rocky mountains and filled with lush, green farms. Traditionally Elgin has been renowned for its apple and pear production. The past few decades, have seen it emerge as a top wine region, which we are proud to share with many other producers of quality wines. 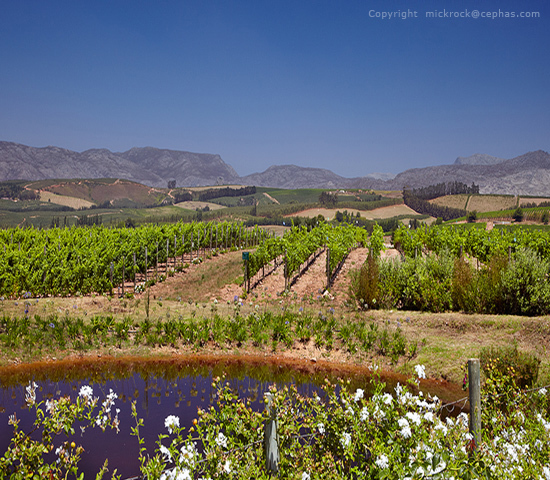 The elevated altitude produces conditions ideal for vineyards, and Elgin Ridge is blessed with cold winters and warm summers. The close proximate to the Atlantic Ocean provides cool coastal breezes that keeps the vines healthy when the temperatures rise. The unique conditions mean a longer ripening period for perfectly balanced wines. Our philosophy of Biodynamic and certified Organic wine, made naturally, begins in the vineyard and ends in the bottle. We produce small volumes of wine using perfect fruit from our certified Biodynamic and Organic grapes. Every bottle with the Elgin Ridge label truly represents our dedication to quality.